How can you be sure that only poor patients are treated for free? How do I know my donation is utilized properly? How does what A New Vision work align with VISION2020 “The Right to Sight”? What is a sustainable solution? 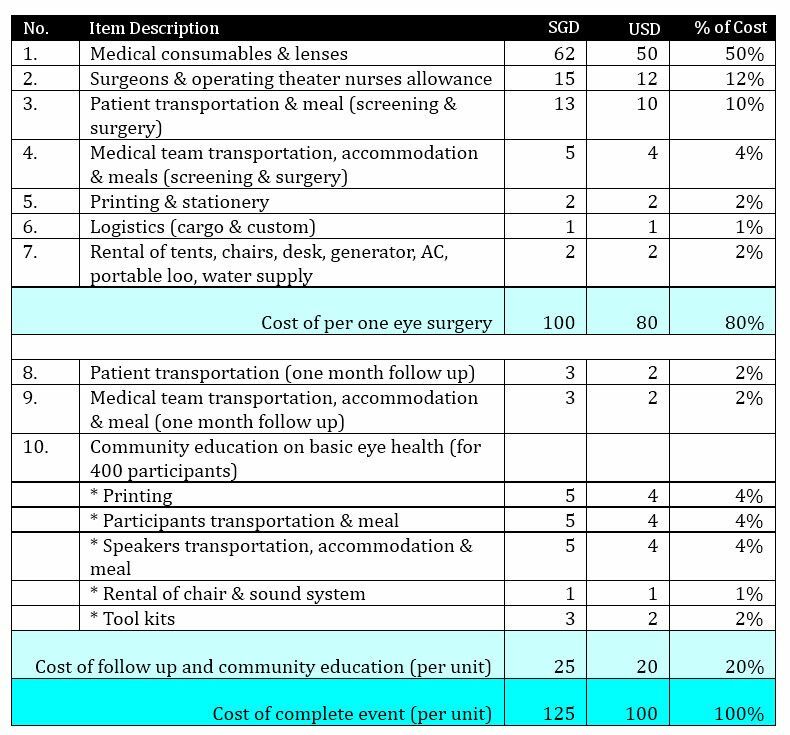 This general cost breakdown is for a single event where the number of surgeries is over 500 (for economy of scale). * foreign exchange fluctuation on expenses denominated in Indonesian Rupiah, Singapore dollar and US dollar. 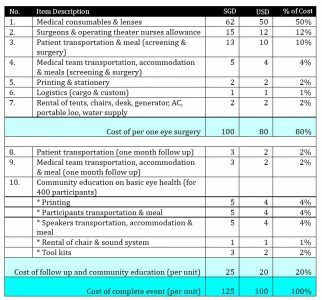 There are no management costs burdened on donation income, these costs are funded by our co-founders. 100% of all donations go directly towards restoring sight, training medical personnel or purchasing the necessary equipment. We are 100% reliant on donations. Our donors come from all walks of life and include, corporate and individual sponsors, families, friends and ourselves. No donation is too small and all assistance is deeply appreciated by our patients. We only operate on patients whose cataracts have limited their sight to 6/36 or below. No one with sufficient financial resources would have willingly allowed themselves to live with this visual disability. As we are currently funded on a “per project basis”, all donations can be traced to each project including detailed itemised costs. Our most recent financial report is available for our donors and potential donors upon request. Please write to we@anewvision.org. A New Vision was registered in 2011 as a public company limited by guarantee in Singapore with registration number 201112891E. As the majority of our beneficiaries reside outside Singapore, we do not qualify for registration as a Singapore charity. Therefore, donations to us do not attract tax exemptions on income drawn in Singapore. How does what A New Vision (ANV) align with “VISION2020 The Right to Sight”? A New Vision is a member of International Agency for the Prevention of Blindness an alliance of civil society organisations, corporates and professional bodies promoting eye health through advocacy, knowledge and partnerships. The ethos of A New Vision is one which builds partnerships with key stakeholders across the regions in which it operates. Through these partnerships, local community members are trained, equipped and motivated to recognize and address instances of curable blindness. In isolation, the clinics conducted by Dr. Ruit and his staff bring immeasurable gains to hundreds of visually impaired people. But more than this, the clinics spark interest, create awareness and motivate the public to take action and come up with sustainable solutions for the future. Information is power. Dr. Ruit, like his mentor – the late Professor Fred Hollows, believes firmly that his most important role is to train and equip local health resources to help multiply their work, adopting a safe, high quality, high volume, low cost method. This is possible as a direct result of the surgical method pioneered by Dr. Ruit and Prof. Hollows. 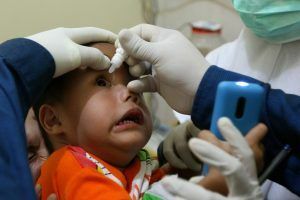 Our goal is to replicate the sustainable Community Eye Hospital model which Dr. Ruit demonstrated to be so successful in reducing the rate of blindness in Nepal, particularly in communities where there is evidence of higher need. Please write to us at we@anewvision.org if you wish to know more about this model and plan which we are working on.